After several months of no blogging, I’ve found some pockets of time where I’m hoping to fit it in. What have I been doing, you’d like to know? Oh, you know… nothing special….. just winning awards…. Our county fair was last month and when I was looking through the items I had made this year and choosing what could be entered for competition, I realized I had been busy. My goal this year was to make at least one thing a week for the whole year. And really, I’ve barely missed a week. Of course, I’m not counting baking or cooking since that’s an every day thing here, but I’m really pleased with how much I’ve been able to get done in spite of the busy-ness of baby’s first year. I entered 12 items and received 12 ribbons. Now, not all were 1st and I didn’t get any grand champions, but I was happy nonetheless. 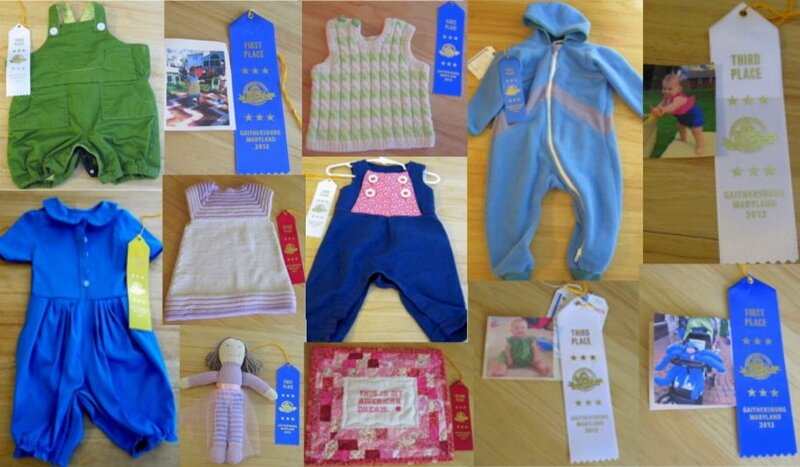 Here’s a big pic showing the items with which ribbons they received. Some of these projects I’ve posted about here and others I’ll post about in the future. In other news, Project Run and Play starts again next week. I’m really looking forward to it. The first week’s theme is a remix of the Very Biased skirt from No Big Dill. I have lots of ideas and I think I finally narrowed down my thoughts into one great outfit. Here’s a shock: it’s another romper hehe. Wow, I'm so out of the loop. You didn't tell me you won with any of those!! Nice job!